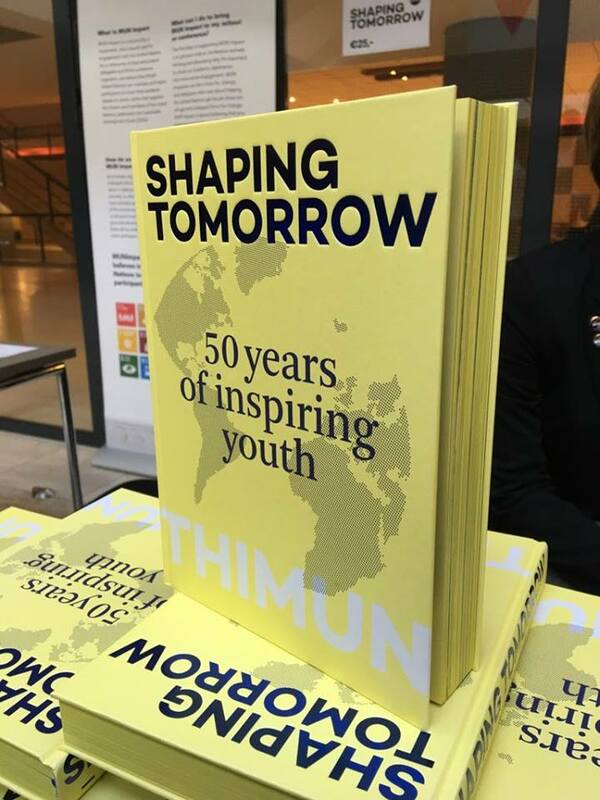 Visitors to the THIMUN Hague 50th anniversary conference were in for a special treat: a wonderful book celebrating 50 years of student debate and MUN action, spanning 1968 to the very recent. 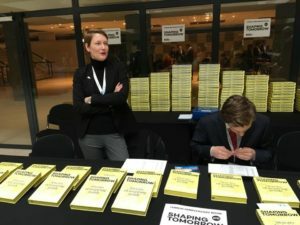 The book highlighted stories from former delegates, MUN Directors, and individuals who have shaped the organization over its illustrious history. 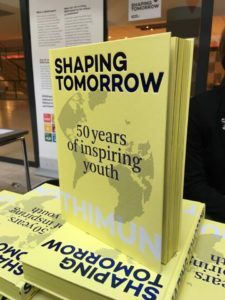 The book was co-authored by two individuals who have made significant and lasting contributions to the THIMUN Foundation, David Williams, former chairman of the THIMUN Foundation, and Reinhardt Smit, former THIMUN Conference Manager. Together they clocked in hundreds of hours, sorting through old photos, newspaper clippings and reconnecting with dozens of individuals who have shaped the organization over the past 50 years. Special highlights include a forward by HRH Princess Mabel van Oranje and special message from the Secretary-General’s Envoy on Youth, Jayathma Wickramanayake. THIMUN Qatar related stories were submitted by THIMUN Qatar’s founder, Cameron Janzen, SG and DSG for THIMUN Qatar 2018, Sandev Ferdinando and Sanskriti Tandon, TQ/O-MUN leader Kabir Sethi, and the HELA story by Rahmatullah Hamdard. 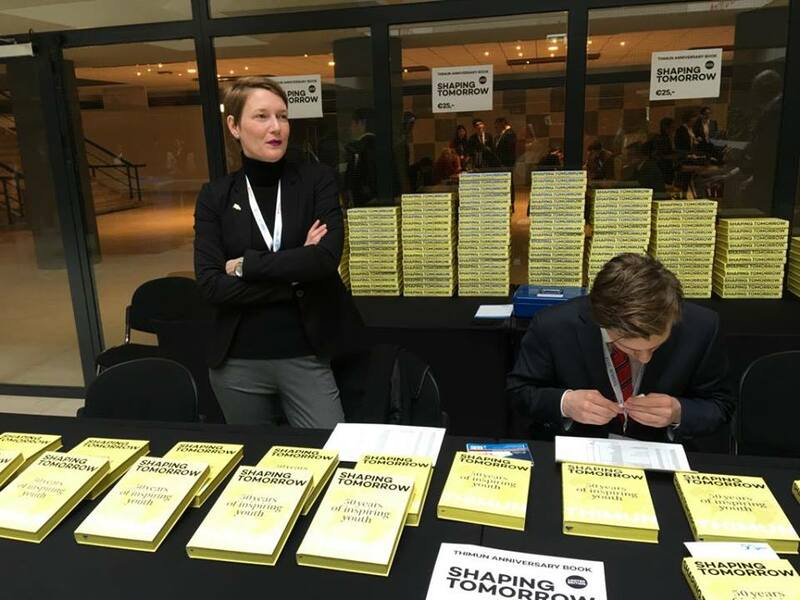 You can still purchase Shaping Tomorrow:50 years of inspiring youth.See this link to order. A worthwhile trip down memory lane and a book that should have a place of pride on any THIMUN enthusiast’s bookshelf! We are living in a country that has experienced three decades of war, where no one has equal rights and where women are considered slaves for men. They don’t have the right to raise their voice, or to work shoulder-to-shoulder with men for their community, their people and for peace. Their only rights are to sit in their homes, do house chores, keep their mouths shut all of the time, and tolerate all the bad things that happen to them; if not then they will be beaten by men or will be killed. The world has witnessed what happened to Farkhunda; a talented young woman who was passionate about her country and dreamt to take action for peace, but she was shut out. No, she was cruelty killed by hundreds of men on the street, her body run over, dragged, and burned. While we all know of things that men can do well, women can also do same and even better than men. If men are dreaming bigger, women should do so. If men are working for their society, women should accompany them. Women should be involved in big decisions, because they have that talent! 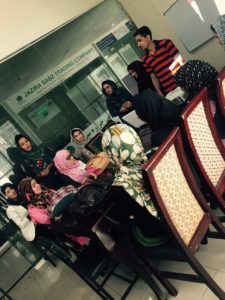 This is why the HELA (Hope for Education and Leadership in Afghanistan) organization is focusing on SDG5 – Women’s Empowerment and Gender Equality. 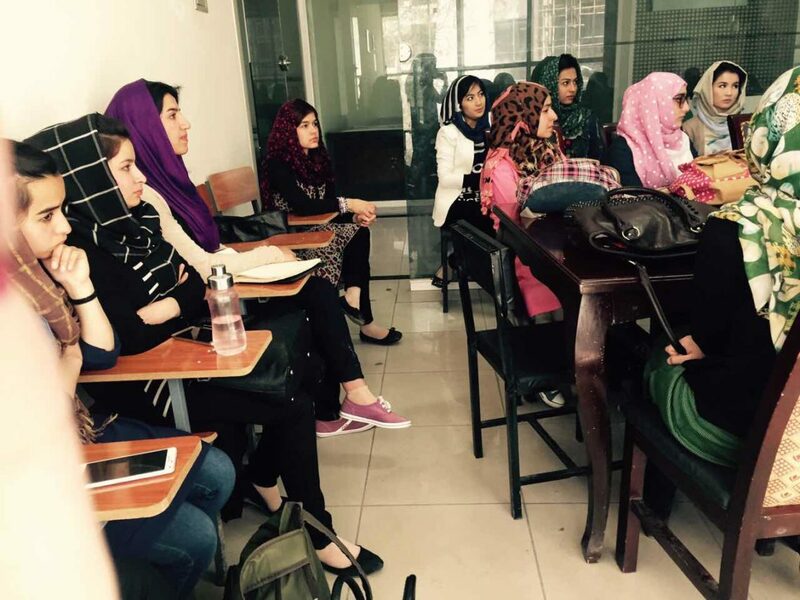 We are promoting Women through MUN, to become the future leaders of Afghanistan, to be able to raise their voice in front of thousands of people without any fear, and to be able to find solutions for the tough situations of their country. 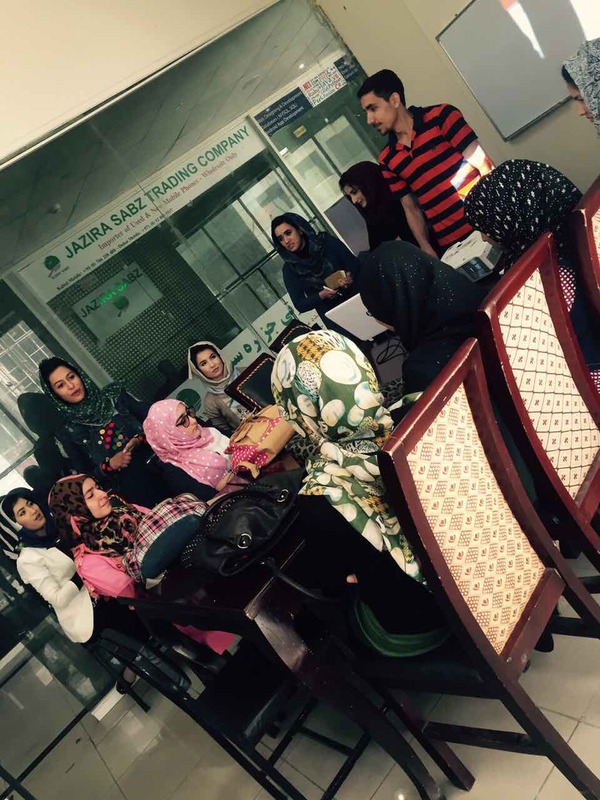 We are also promoting women through another project of ours, which aims to create the future business women of Afghanistan. And the reason that we do this is: because we believe that what women could do, sometimes even men can’t. So, last but not least, I would say this: this world is incomplete without consideration for every single person. But look at us- we are not considering an entire gender. So we can’t say that we are complete; we would- and can only- be complete if we give equal rights to women! When the United Nations were established at the end of World War II to prevent any other conflict of such magnitude, the United Nations Security Council was tasked with the great role of maintaining international peace and security and preventing the escalation of a conflict into an armed struggle at all costs. In the last decade, the Security Council has been meeting almost continually to address ongoing issues of global importance that pose a threat to the maintenance of peace. It consists of 15 nations, 5 of which are permanent (Also known as the P5, consisting of UK, USA, France, China and Russia), who possess the veto power over which there has been a great deal of debate over, as it is misused by certain members more often rather than not. The other 10 member states are elected for two year terms and typically there should be a representation of each geographic region of the planet. 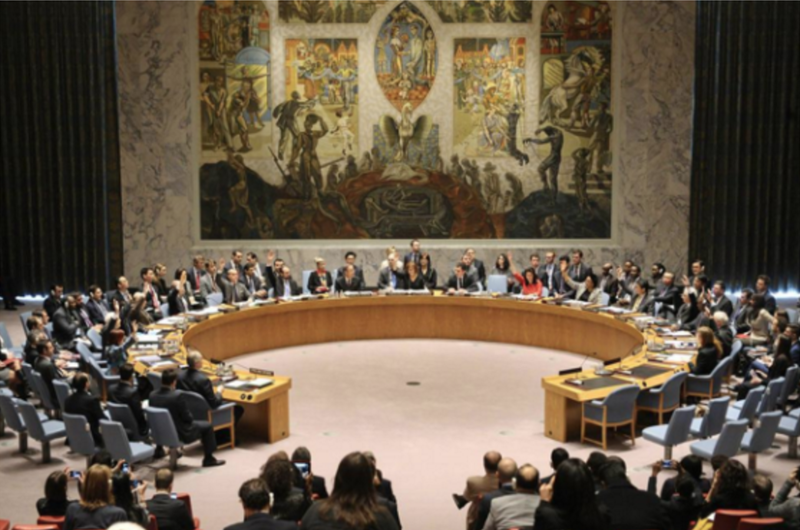 The Security Council is the only UN body whose decisions are legally binding. It is also the only body which can authorize military action. Nevertheless, this is often the last choice as the purpose of the Security Council is to, as previously mentioned, prevent armed conflict at all costs. As such, the council elects to impose economic sanctions on nations unwilling to cooperate. Since its establishment, the Security Council has established a number of important peacekeeping operations, for example MINUSCA, which will be discussed alongside the issue of Central African Republic. Currently, there is significant discussion happening over the reform of the Security Council, taking into consideration the distribution of the veto power, the permanent status of nations and methods of refining the inner workings of the council. The ongoing conflict in the Central African Republic is one of the many that cannot be easily summarised in one paragraph. It is the direct consequence of religious, political and social instability, fueled by ethnic divisions and unstable government. (It is said that since its independence from France, the country has been everything but a Republic). From an empire to a dictatorship to the hideout of some of the worst African War Criminals, the citizens of the Central African Republic have seen it all, and little improvement is one on the horizon. With the transformation of a relief mission called MISCA to a UN peacekeeping operation called MINUSCA, the UN Security Council realised the volatility of the region and the importance of maintaining peace there. The issue of the Central African Republic appears regularly on the Security Council agenda, yet a satisfactory resolution is not reached very often. Support for the country is underway, both at a peacekeeping and a humanitarian status, but the Security Council has yet to effectively apply long term solutions to the problem, establishing a secure environment in one of the poorest, yet tremendously important players on the African political field. Nearly 6 years of civil war has entrenched Syria, managing to amass an astounding death toll of more than 450,000. What started as a peaceful anti-government protest escalated into a full wage multinational conflict pooling in countries such as the United States, Russia, Saudi Arabia, Turkey, and Iran into the conflict. Internally, Bashar al-Assad and his army have clashed viciously with opposition groups in bids to gain control over territory. Additionally, the so-called Islamic State (IS) has been rising in authority in the region, making Syria a cauldron of both internal and external conflicts. As a result of the Syrian Civil War, today, Syria is the world’s largest generator of Sunni-Shiite sectarianism. Furthermore, the Syrian conflict has forced more than 11 million people into displacement, causing yet another crisis, as a result – the refugee crisis. Ultimately, it is the mixture of international interventions and internal disarray that has made the “Question of Syria” one of the deadliest conflicts of the 21st century. The UN Security Council has worked actively on the conflict, and has usually ended up in a state of division when it came to the agreement between China and Russia on one sides and the United States, United Kingdom, and France on the other. Regardless, it managed to facilitate the entry of international aid and support through resolution 2268. Terrorism has been present for many years and as of the past two decades it has been on a rampant rise. The act of terrorism has always been to invoke fear and panic within a population, intending to cause major physical and psychological damage to all those involved. Just ten years ago in 2006, almost two hundred thousand casualties had been recorded as a result of terrorist acts, and this number has only continued to grow within the past ten years with most recent attacks in countries such as France. Furthermore, the rise in terrorism has increased with the alibi of religious extremism with groups such as Boko Haram and ISIL. The threat of terrorist acts being committed have increased around the globe with one of the major causes towards the rise being increased funding to terrorist groups, especially from state sponsors, as in many cases terrorist groups while a threat to certain nations, can also provide strategic advantages for others. The Security Council works tirelessly to be able to create resolutions towards being able to hinder terrorist groups and eventually work towards the removal of all terrorist groups across the world. It was that epiphany of a moment where I sat in one of my conferences and looked around. There was not one single representative from a Pakistani school! I have always had a passion instilled in me to do better, to bring change. The patriotism and dedication I had to my country, brought about my passion to better my Pakistani community. 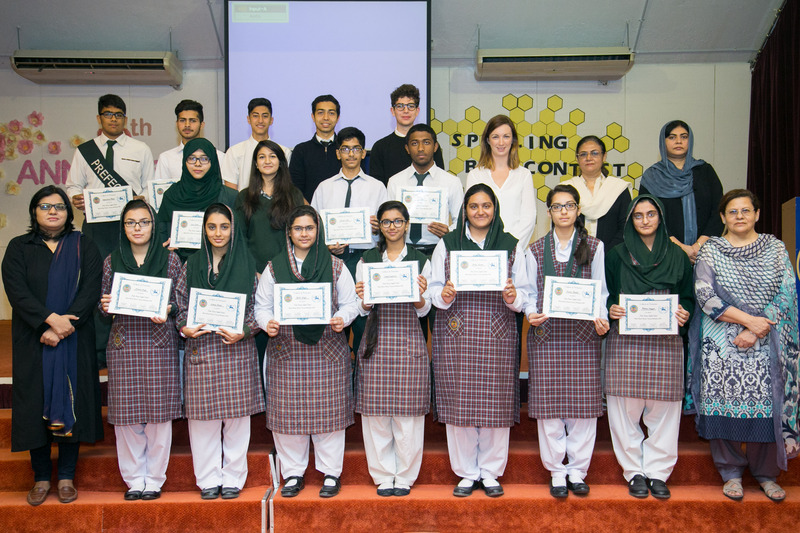 Before long, I had a an entire proposal planned and prepped ready to be implemented on how I was going to start MUN at one of the Pakistani schools here in Qatar – Pakistan Education Centre. The principal of PEC, Madam Nargis Raza Otho, extended her greatest gratitude to welcome my initiative and the plans I had wished to impose. 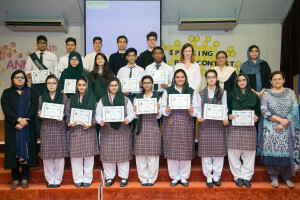 The prepared assembly to a collective group of students from Grades 9-10 at Pakistan Education Centre marked the beginning foundations of the budding Model United Nations to be established. I was excited to finally be standing in front of them all! The assembly was an explanatory one, to show the basic gist of MUN and make aware to the students of the fruitful opportunity which would be at their grasp. 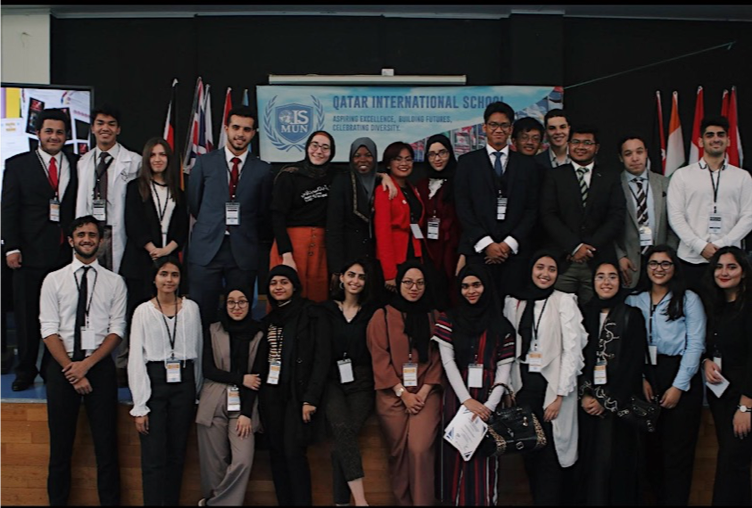 In my assistance, my director Ms Naomi Rennicks and our PHESMUN Secretary General Chris Nasrawi, both added a courteous speech to the students to showcase the virtues Model United Nations had to offer. 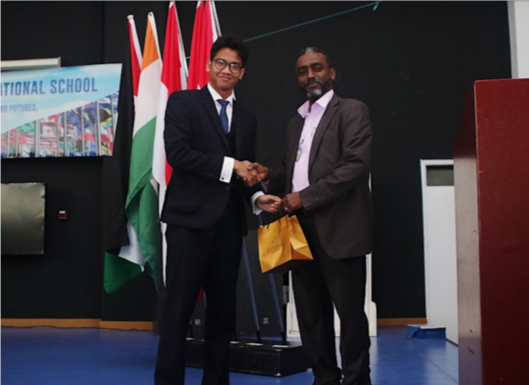 The introductions had been set, mandatory applications were distributed and that enthusiastic buzz in the pool of students which I was lucky to witness, had me euphoric for what was to come. The month prior to the assembly was a hectic combination of meetings, discussions and simple hardship of bringing the MUN workshops to life at PEC; with Madam Zaibunissa Kazi, Madam Naheed Akhtar and Sir Rana Wasim, this initiative would not have been even remotely possible with the continuous support, patience and the strong commitment they had. These teachers from PEC, I would like to thank for working with me collaboratively in every step of the way, with generosity and sincerity. The month of training I gave lasted a total of 8 sessions, with 16th January 2016 being the first. When I met the students for the first time, they surpassed all of my expectations and were even better than I thought they would be. Every issue was taken with the utmost interest, from illegal immigrants to the refugee crisis, and hands flew up at every question I asked. It was what I would define perfectly as ‘youth in action’. The energy in the room was always hyped and energetic, and complimented the spirit needed for something like MUN. 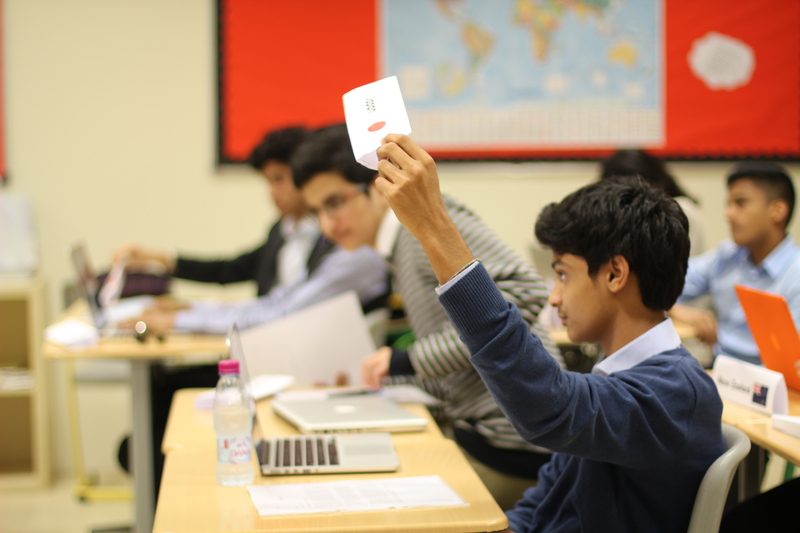 Many of the students were already conclusive debaters and the vigour in their opinions and arguments reflected it. Despite it being Saturday mornings, we all beat the odds of morning blues to fight for another change, another idea or another breakthrough in resolving the stakes of the issues at hand! We even had a couple sessions over at Park House English School to put the skills the trained fifteen had to test. To be thrown into a completely new environment, with a blend of different students – was an experience that was new to them all. It was the chance to practise what they had learnt with me and hopefully be able to use them farther when they attended their future conferences as well. And now, with the entire training of MUN for my fifteen has elapsed, I definitely feel sad about it all coming to an end. Each individual student was unique and never failed to surprise me. We held our closing ceremony with certificate distribution on Sunday, the 6th of March, as a way of commemorating the entire journey praise those who participated. 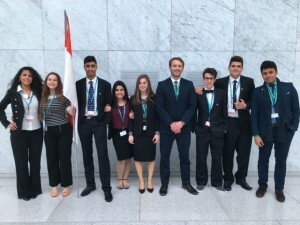 The PHESMUN Executive Team showed their support in attendance as well – Director Ms Naomi Rennicks, PHESMUN Secretary General Chris Nasrawi, Deputy Secretary General Mousa Al Waraki and Head of Admin Firas Al Chaer. We all have shared an immense bond over the journey we have had and I wish every single one of them the best of luck for their future MUN aspirations. 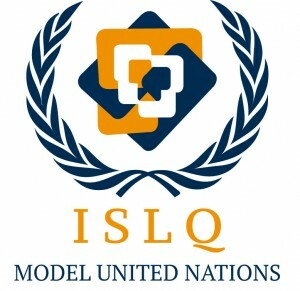 With that, I feel proud to say that Pakistan Education Centre is the first Pakistani school in Qatar to be taking part in Model United Nations! The THIMUN Qatar office is pleased to announce the 2017 THIMUN Qatar Executive Team. You’ll be hearing more from them in the months ahead. A big congratulations to Secretary Ahmed Al Hajari and his Executive Team. This article is brought to us by Press Member and OMUN member, Dema A’bbas . When I used to talk about adventure, I always included jungles and road trips on my own. When I used to talk about fun, I always included the quietness of being alone on a Saturday night as I typed down some thoughts while listening to music. When I used to talk about ambitions, I always included finding a place I could always call home. Turned out that this place I wanted to find wasn’t located on any sort of map. Instead, it was between the airy laughs and sarcastic jokes exchanged between all the delegates my eyes could catch sight of and my ears could hear as they chatted while they walked in their suits, looking all professional and determined to prove their opponents wrongs, all the way to their committees’ rooms. It also turned out that those adventures I yearned for actually had to be shared between me and a huge group of people, who were nothing less and everything more than family and amazingly caring, loving, enjoyable people the world has ever granted me a chance to meet. THIMUN is an experience that provided me and everyone I knew with other meanings to what life and family is. In only three days, I got to meet a whole lot of people, and they all had one thing in common which was the diversity in who they are. Everywhere I looked, I saw new faces that came from a certain place in the world. Teenagers from literally everywhere filled the building, giving a piece of their minds and cultures to everyone else surrounding them. The joy could be felt in the ambience, especially when it was time for the, rather I say it, marvelously enchanting ceremonies – where it didn’t matter who you sat next to because simply: you’d always have fun with anyone, no matter what country or religion or any symbolic title they held dear to their hearts. 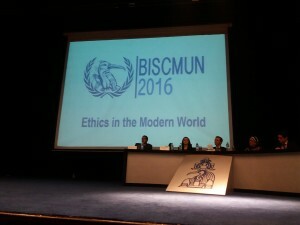 In THIMUN, we are all humans who want nothing but to have fun and make friends. -Waseem Abadi, and of course I had to mentally slap him for saying he felt like an outcast, for he was the life of the party. –Eman Ghanaiem, who was so much fun to hang around with and laugh along with when she glared playful daggers at our hearts whenever we were being (annoyingly) a group of complete morons. Go for it! It’s worth the chance and shot. You’d always find your way when you go there. It’s a bit nerve wrecking at first, but once you get in the scene, trust me when I tell you that you’d never want to leave. Abiding by the words of the Secretary General, ISLQ is hosting its first local conference on the 24th and 25th of March in the school’s campus. The conference is going to host several schools from around the country and welcome delegates to explore the conference’s theme of “A Changing World: Technology & Globalization”. 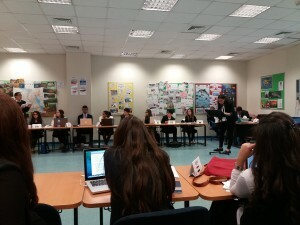 With over six different committees including the Human Rights Commission, Economic and Social Council (ECOSOC), and several General Assemblies (GA), delegates will have the opportunity to enhance their diplomatic communication skills and construct arguments expressing their country’s views on contemporary global issues. Debates will revolve around the issues of legal barriers in the workforce, the promotion of regional trade, and issues associated with cyber security, among others. ISLQ MUN conferences aim to develop critical thinking by sparking debates on issues in our current day. 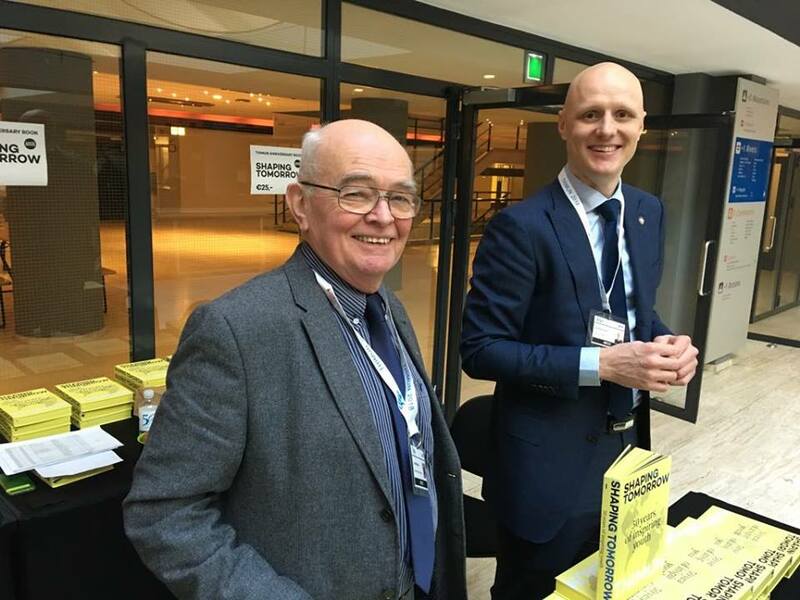 We are looking forward to welcoming the delegates in March and hope to see an amalgam of old and new faces in the conference. 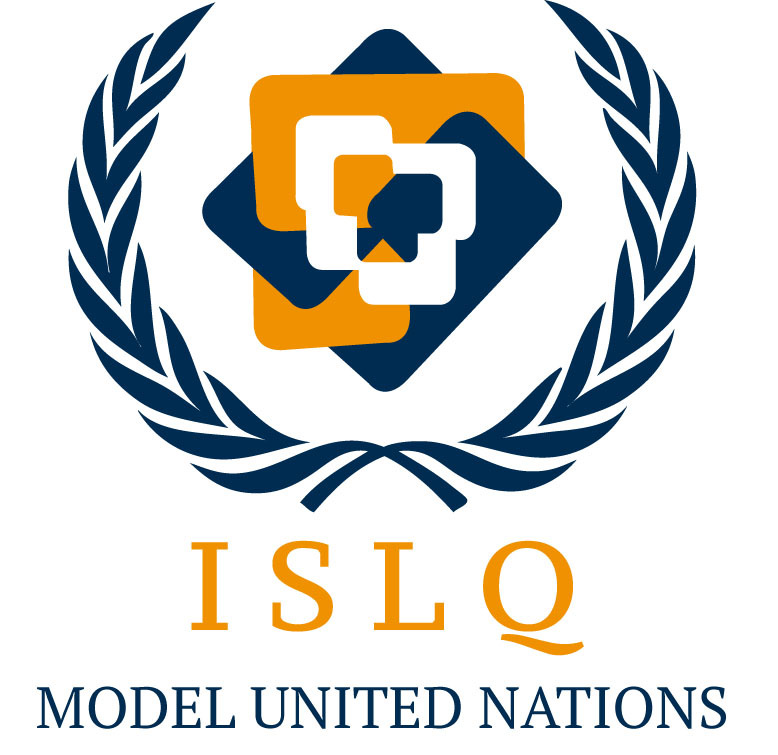 In the meantime, find us on Facebook: ISLQ MUN; and Instagram: @ISLQMUN. Whenever asked about my favorite experience, MUN always comes to mind. The rush of the students, the excitement of the newcomers, and most importantly, the diversity of the participants all contribute to numerous experiences that will never be forgotten. 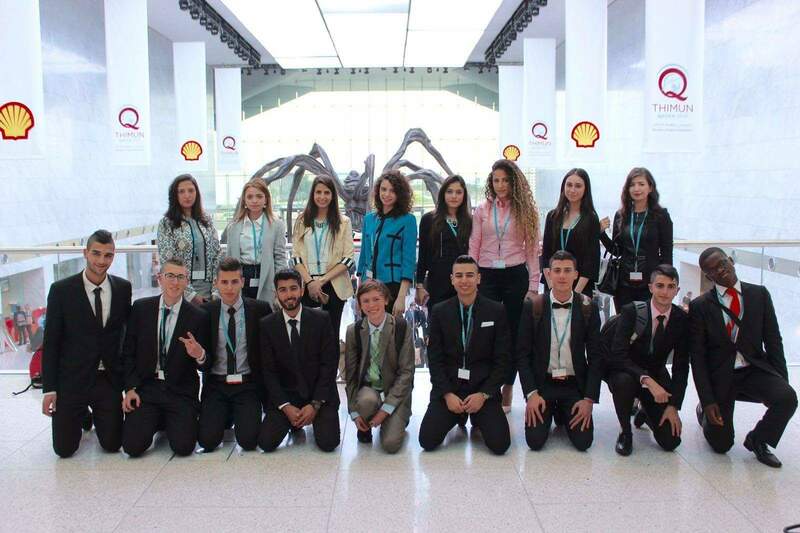 This past January, the fifth annual THIMUN Qatar (TQ 2016) was added to my list of MUN conferences! However, we can get to that later. Allow me to start by introducing myself; I am a Palestinian girl living in Doha, Qatar; currently a junior at Qatar Academy and doing my first year of the International Baccalaureate (IB). My name is Reem Abdul Majid. MUN became my single and sole passion at a young age. I always had the vision of sharing it with others with the hope that it would open their eyes as it had done to mine. 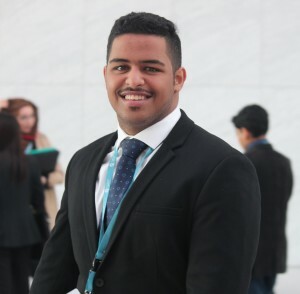 One of the most memorable conferences of my MUN career so far was THIMUN Qatar 2015 (TQ 2015.) This specific conference was special to me because it had hit me in the soft spot of my heart the way no other conference had done yet! It had taught me what it meant to be Palestinian. Living outside of Palestine, I never had the opportunity to simply sit down and have a cup of ‘kahwe’ (traditional Palestinian coffee,) with teenagers of my age that live in Palestine. Residing outside of ‘el-bilad’ (my home country) meant giving up that right instantaneously… Until now. 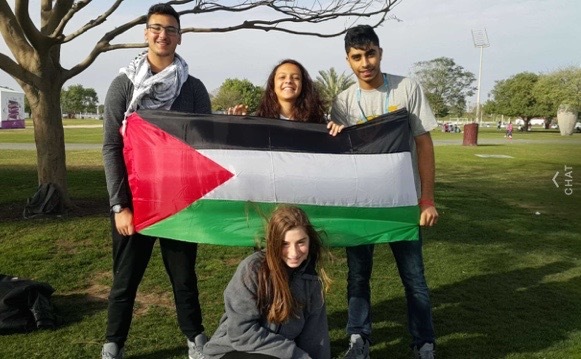 During TQ 2015, a Palestinian delegation graced us with their presence in attending the conference, and for the first time in my life, I learned what it meant to be from Palestine. It was even more interesting as this specific delegation came from within the 1948 borders. The Palestinian delegation came through the Online Model United Nations program (OMUN). 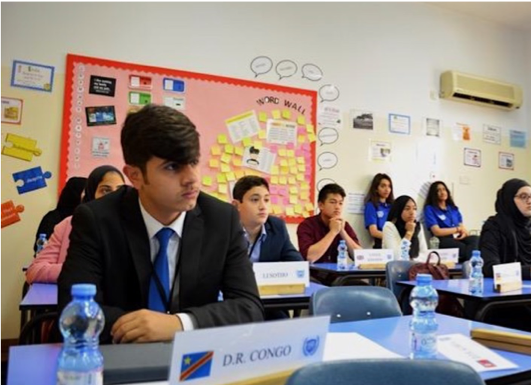 There were only seven delegates, but this was more than enough to change my way of thinking and for that I thank THIMUN Qatar. Now fast forward to TQ 2016. I began counting down the days down to this conference as soon the gavel hit the platform to signal the closing of the final day of TQ 2015. The days went on and on and finally, at around 120 days left for TQ 2016, I was called into my MUN Director’s office (Ms. Lisa Martin) along with my classmate and very good friend Mohamed Altaji. Mohamed is Palestinian and is also very active as an MUNer. We were offered to mentor a Palestinian delegation of 7 delegates coming to TQ 2016 through an organization called “Seeds of Peace”. It took me by complete surprise and took me less than a few seconds to make up my mind and agree. I left the office with a feeling of euphoria asking myself questions like ‘is this real? Is this it? Mohamed and I were ecstatic. This was really happening. We could finally drink our tea and coffee with Palestinians living in Palestine. We instantly began planning for their arrival. Two of the seven delegates were coming from Gaza, while the rest came from parts of the West Bank and Israel. Mohamed and I decided that social media was the only and best way to communicate with the delegates. So we created a Facebook group. This allowed us to introduce ourselves to the Seeds of Peace directors and the delegates themselves (the seedlings.) Through Facebook we were able to post information on how to write a policy statement and resolution. 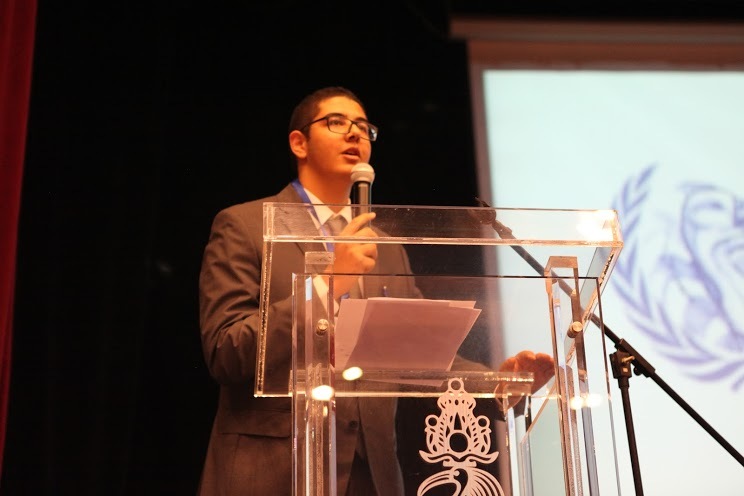 For some of the delegates, it was their first time debating in MUN so they received their first training on an online course provided by Mohamed and I. We were able to answer plenty of their questions questions and offered feedback to each piece work prior to the conference. 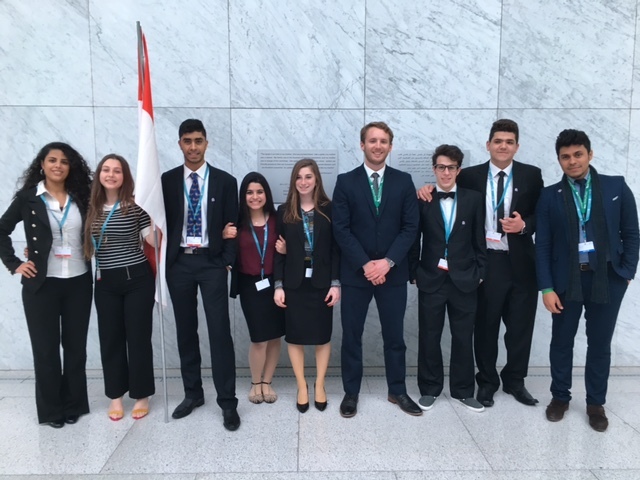 However, beyond MUN, Mohamed and I decided that we wanted to take it one step further and really get to know the delegates. 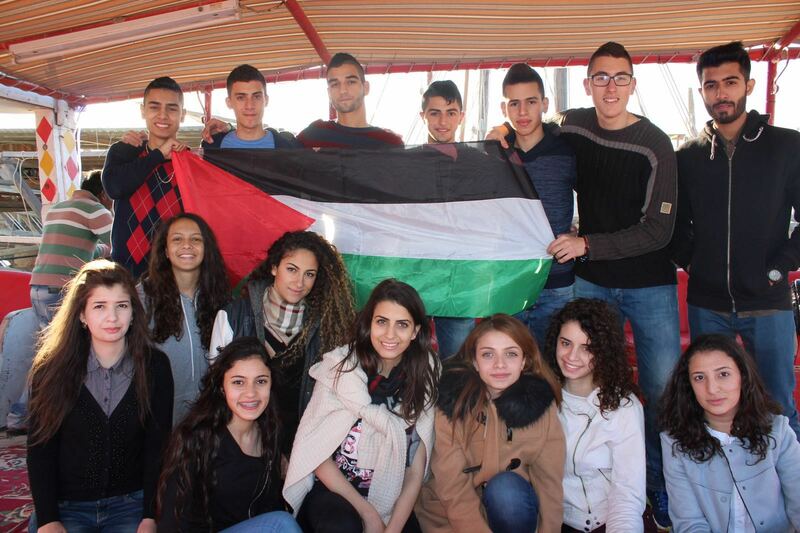 We wanted to make friends in Palestine. So when all the planning was well and done, and the the activities booked and ready, we waited for the Seeds of Peace to arrive to Doha. This is a date I will cherish for my lifetime. It was the day we met the seedlings. Mohamed and I greeted them in their hotel lobby the morning before the conference began. Hamada, Kamal, Waleed, Lisa, Mysoon, Dana and Raghad. We finally met them. We introduced ourselves in person, sat down and had breakfast with them. Instantly, stories began to be traded faster than freshly baked Palestinian fatayer (homemade baked goods) with the neighbours. 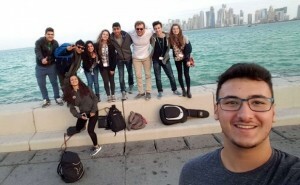 They were the most amazing stories… their journey to Doha, their everyday lives, pastimes and hobbies… it did not take long for me to realize how similar, but also how very different our lifestyles were. When we were all well fed we set off to get the day started. Mohamed and I took the delegation bowling. It is a rather common activity in Doha, but it did not seem like it was in Palestine. A bond was instantly formed. 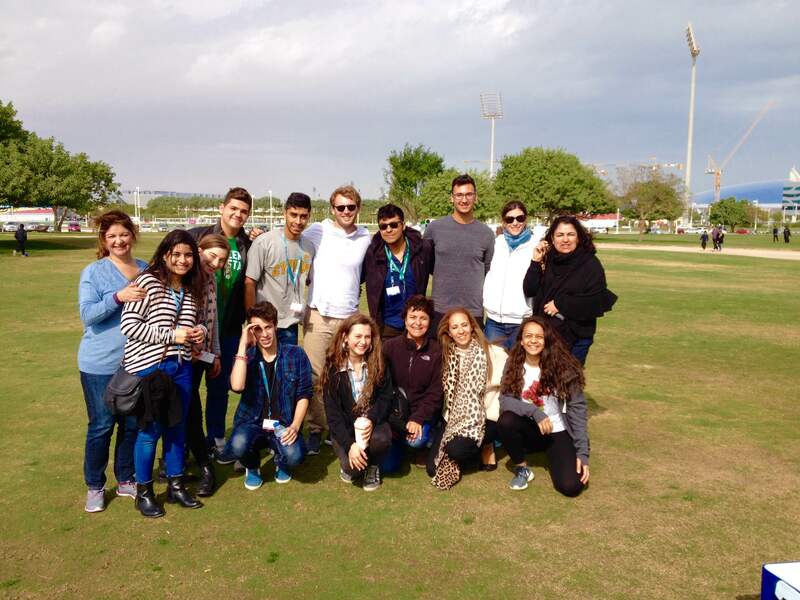 Later in the day we took them to Aspire Park, one of the parks in Doha. There, Mohamed’s family welcomed us and showed tremendous amounts of love to the delegation. Of course we had to show them Doha’s giant skyscrapers and marina, so we brought them to the corniche. As there was very little time before sunset we hopped on a dhow and took a cruise around the corniche. I will never forget the look on their faces, especially those who came from a place where visiting the beach was denied from them. We ended the day with dinner at Souq Waqif a traditional market located in the heart of Doha. 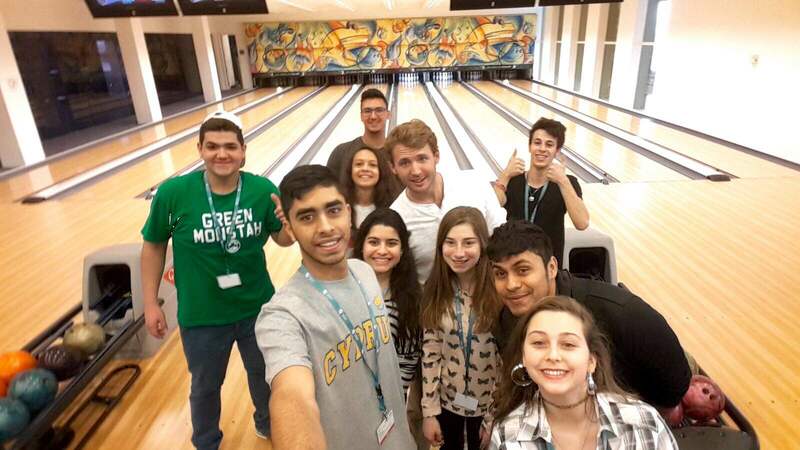 In this dinner we combined the Online Model United Nations delegation, which had fifteen Palestinian delegates along with the Seeds of Peace delegation as well as each groups mentors and supervisors. This was something phenomenal! Everyone was making new friends! The conference itself passed by in a blink of an eye. The seeds engaged in valuable debate on the important issues of the world today. Most had gone up to the podium and presented their opening speech in front of more than a hundred delegates. I would say that they were pretty popular in their committees. This was rewarding for Mohamed and I to hear. The last day of the conference ended with a cultural night hosted by TQ. It included cultural music, activities and dinner. We all danced along to traditional khaleeji music as well as the traditional Palestinian ‘debkeh’. It was a bittersweet moment. I had made a family. And it was this that made all the difference in the world.